Ahem… anyway, my Mum was in Iceland recently (lucky sod) so I convinced her to go on a mission for me. You see, apart from making you stumble over yet another lump of stunning wilderness with each step, Iceland also has another point of interest. Two of them in fact, as the island is home to two new whisky distilleries. The Scandiwegians are increasingly becoming known as avid makers (and drinkers) of whisky, with stills operating in Sweden, Norway, Denmark, Finland and now, with the opening of Thoran and Flóki, Iceland. Fortunately, my Mum was able to locate a bottle of Flóki for me in the Iceland duty free. Eimverk Distillery, opened in just 2009, is currently the only Icelandic distillery with whisky available for purchase (Thoran has not yet entered full production at this point). 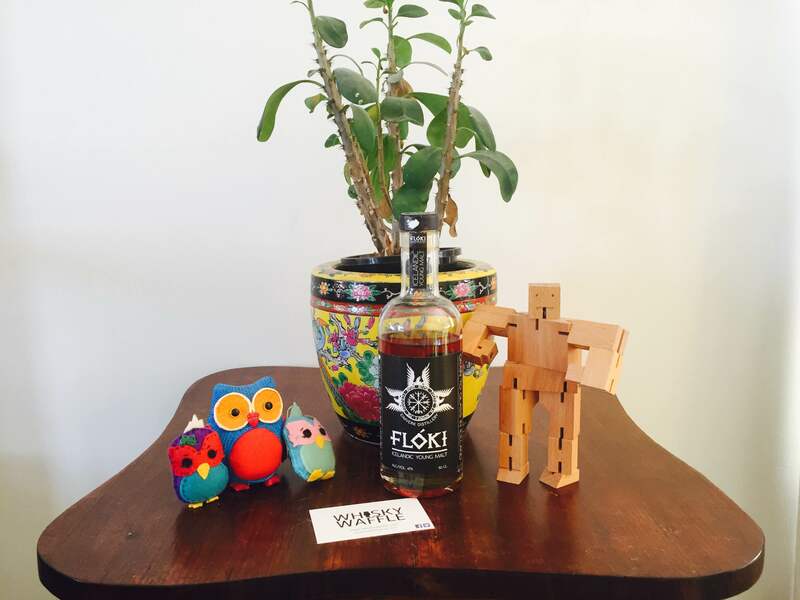 It turns out that the team at Flóki are a crafty little bunch, hand making their own pot still. They also produce their whisky using 100% organic Icelandic-grown barley which, keeping with the craft approach, they malt by hand. Apparently, thanks to the Arctic climate, Icelandic barley is slow growing and low in sugars, meaning that the distillers have to use 50% more barley per bottle (compared more temperate climes I suppose), which they claim gives their product a unique taste. Fortunately, thanks to my maternal benefactor, I have a bottle on hand to be able to verify said uniquity. The Flóki Young Malt, as its name hints at, is not their flagship release. The reason for this is a question of time rather than choice, as their spirit has not actually been under oak long enough for all systems go, with their Icelandic Single Malt to be unleashed later in 2016. Thankfully to get the ball rolling they released the Young Malt as a limited single barrel Iceland duty free exclusive. The bottle is awesome (if too small. Curse you limited release! ), with a wicked Viking-inspired crest and angular lettering on a textured black label. The liquid contained within is a rich amber-brown that catches your attention straight away. So no worries on the eye, but what does Iceland’s first whisky taste like? Pretty good for such a young whisky it must be said. The nose is really curious; it’s really, really floral and fruity (pineapple, mandarin, pear) with a slightly salted caramel edge that keeps you sniffing. You know what, if you’ve ever had the chance to try some new-make spirit, then you’ll know what this smells like. On the mouth the Flóki is sharp, slightly bitter and prickly. It pretty much jumps off its longship and starts jabbing away with its spear, although part of the reason for that is probably the 47% strength. The finish coats the tongue with that raw, grassy, hay-like quality that seems common amongst very young whiskies, followed by a lick of spicy fruitiness. It’s certainly an interesting experience to try, but you can tell that the Young Malt is only the first step down the road for Flóki. It’s kind of like a teenager whisky, full of all sorts of raw, bubbling emotions and ideas, unsure about its place in life. Given time though it will gain maturity and understand what it really wants to be. Then again, we can’t judge it too harshly as it was never meant to be the be-all and end-all. This is but a glimpse of a whisky that I think will one day stand shoulder-to-shoulder with all the majesty of the Icelandic landscape. Visited Iceland myself about a decade ago! Long before either Iceland or myself got a taste for whisky. Excited by the new whiskies – Mackmyra from Sweden is the only Northern one I’ve tasted – and it’s lovely. I would really love to go… sigh, one day. Yeah, I tried one of the Mackmyras and it wasn’t too bad. I seem to recall it being very smooth, which perhaps appeals to your Irish whiskey-quaffing sensibilities? Scandiwegia is certainly a region to be watching these days.